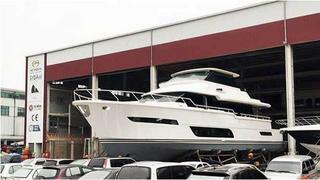 Horizon Yachts has two new motor yachts - the E78 and V80 - all but ready for delivery to the US this spring. The Taiwan-based builder’s Twitter feed showed images of a Horizon E78 motor yacht and a Horizon V80 motor yacht both looking near to completion and scheduled for delivery and handover to new customers for the 2015 US season. It’s clearly a busy time at the Horizon yard – earlier this year Boat International reported on Horizon delivering a new Horizon P110 and a Horizon E84 to the USA. The Horizon E78, which should be ready in April, has an LOA of 23.93 metres and beam of 5.7 metres. Customers can choose between twin 1600hp CAT C32As or 1550hp MAN V12s in the engine room, while the fuel capacity of around 7,000 litres gives a huge cruising range. The motor yacht can take eight to 12 passengers in four staterooms and crew quarters. She is designed as a family cruising yacht, combining spacious living with excellent sea-keeping ability. The builder offers a large degree of customisation and the layout and fit-out means she can be used as an owner operated or crewed yacht. One notable feature of the boat is her relative lack of interior bulkheads, creating larger spaces and better views. Open Bridge and Skylounge versions are also available. The E78 comes in behind the E84 and E88 in Horizon’s E series, which comprises eight yachts in all, starting at the E56. The V80, which is heading to the US West Coast this spring, is from arguably Horizon’s most distinctive series, comprising just this and the V72, but both offering eye-catching exterior styling and a streamlined interior that maximises views, space and style with flush transitions between areas and uninterrupted lower deck windows that let natural light flood in. The V80 is a grander version of the smaller model, with room for two more people (10 in all) but the same engine option of twin CAT C18s at 1150hp each. The boat is designed to handle the needs of divers, anglers or a family cruise, within its LOA of 24.9 metres and beam of 6.25 metres.